Hi this first approved ROM of Micromax A311 Canvas Nitro Stock Rom V1 and here is a easy and safe tutorial of this update processes. It is Stock Rom V1 of Micromax A311. Canvas Nitro comes with a 13 megapixel camera, 5 megapixel secondary cameras and runs an Octa-core chipset clocked at 1.7GHz. This is MediaTek MT6592 processor chipset. Canvas selfie lens comes with 2 GB RAM, 8 GB Rom and 5-inch full HD and 2500 mAh Battery. After reading this article you will be able to get the answer of your question how to install first approved ROM on Micromax A311 Canvas Nitro. Step 1: Install drivers on your PC (If you feel any problem in install driver then watch this video click here ) and Enable USB Debugging on your Phone. Go to Settings >>> Developer options >>> USB debugging check it ( If your phone have Android 4.2 or upper version then see how to enable Developer options here is guide of this click here ). After then switch off your phone. Step 2: Extract Stock ROM and YGDP flashing Tool folder, where you want save. Open the YGDP flashing Tool and run YGDP_Setup_V3.83.exe. This is very simple installation wizard (Next >>> Next >>> Next >>> Install >>> Finish). Now double click on the YGDP flashing Tool icon ( if you are use windows 4 or upper version of OS then you will get a pop for compatibility issue. see in this image). Now close this error tab and right click on the YGDP icon and select properties, then you will get YGDP properties tab. 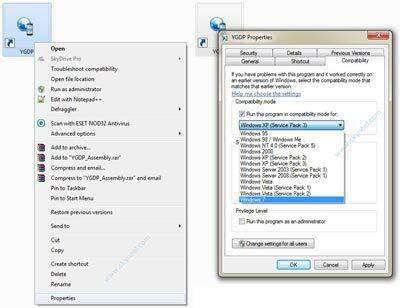 Now tick on “Run this program in compatibility mode for” and select your current windows version by drop down menu, then click on apply and OK. See in this image. Step 3: Now click on YGDP Tool again, you will get a YGDP tool login tab. Here you will see that username already add, Now add the password 369 in the password box then click on login. >>> click on config button in the YGDP tool, then you will see Download Configuration tab. Here you can see highlighted port and browse button, click on the browse button and select CPB. 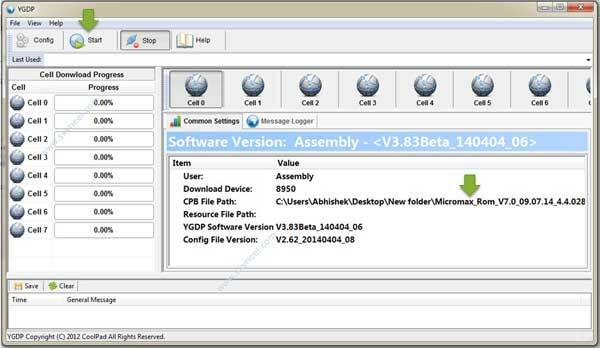 You will find this CPB file in the extracted Stock ROM folder. After load CPB file, click on apply button. See in this image. Step 4: Now Connect your switch off phone with The PC via USB cable (Make sure your phone is switched off). when your phone is connect then Cell 0 is highlighted then click on Start button. Now start downloading Stock Rom in your phone by flashing. you can see flashing process in Cell 0 Progress bar. See in this image. Step 6: Now disconnect your Smartphone after Stock Rom flashing process complete successfully. Now switch on your phone. Step 1: Connect your phone to PC via USB cable. Download Factory mode fix tool click here and extract it. Now open Factory mode fix tool folder, the right click on cmd.exe and click on Run as Administrator. you will see a Command box tab on your screen. Step 2: type adb shell and press enter, wait for some time then type fctest system reboot and press enter. 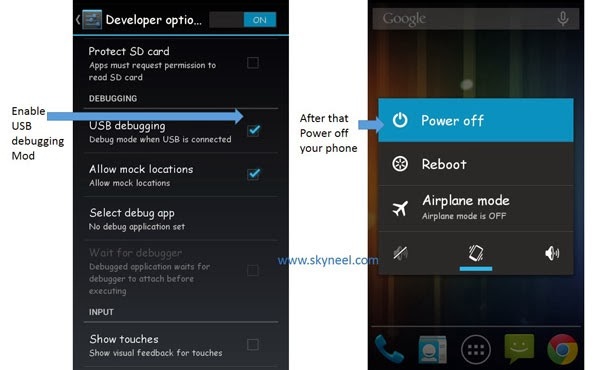 Now your Smartphone will reboot automatically. It will take time approx 10 min. Step 3: After the phone start completely, click to open “unFactroy Mode.bat” file in the Factory mode fix tool folder. You will see Command prompt screen then press Enter 2-3 times, wait for finish it. After finish your phone reboot again. That’s all. After install Micromax A311 Canvas Nitro Stock Rom V1, you can root your phone because root allows you to use a maximum of your phone without any restrictions. After root you will install custom apps, Rom and custom setting in your phone. But first read Root Advantage and Disadvantage by this article, then here is a root guide: How to Root Micromax A311 Canvas Nitro without PC. I hope you like this Micromax A311 Canvas Nitro Stock Rom V1 installation guide from which you will be able to easily install Micromax A311 Canvas Nitro Stock Rom V1 without any extra efforts. If feel any problem in this guide then please use comment box. Thanks to all. dear i gave my Micromax A311 phone to authorised service centre for fixing problem of continuous rebooting while switch on phone. Service centre at Vellore could not fix by installing the software and informs that they have to replace the mother board with high cost. I still doubt about the issue on mother board. Could you please confirm the procedure to fix. thanks and regards. you will be try this Guide for fixing Reboot issue, I think its resolve, this is a not big problem and not motherboard related. My device A311 can’t getting network..
Hi Here is guide to fix IMEI number issue. Okay. First of all the phone is stuck in boot loader and there is no way I can enable USB debugging. Now is there any possibilities that I can repair my phone? Hi Anmol Flash your stock Rom again. I have the Time service virus in my phone. What to do? Use Nod32 Antivirus, it is free. If your problem is not solve then flash your Sock Rom on your Phone. My phone is not getting detected on my computer. Its canvas nitro a311. I tried the usb driver manual installation steps but still its not detected. Could you please provide me the any tool which could download and install the driver automatically…. If its not present, then open about phone option in setting. Tap repeatedly on build number until you see a message “Now you area developer” then ypu get the developer option. Install Vcom Driver on your PC. Sir is its work on micromax a 310? ?